If a tree falls in the forest and no one is there to hear it, does it make a sound? That is a wonderful philosophical question. However, there is ALWAYS “someone” there to hear—whether they are eight-legged, six-legged, four-legged, two-legged, or no-legged. And the brand new interactive exhibit “Fallen Log” at the Springfield Science Museum is a wonderful tool for learning all about those many “someones” who are present in the forest at all times. So who does live in a felled tree? Well, a centipede to start with. The soft skin of a centipede needs the damp sheltered spaces found in the rotting log to keep cool and moist. It survives by hunting the insects, spiders, and slugs who also live in and around the log. The Eastern Chipmunk often dig their burrows near rotting logs which hides the entrances to their burrows and helps them avoid predators. The moist environment beneath a rotting log is ideal for Spotted Salamanders. “There’s a good chance you can find a salamander in a forest living beneath fallen logs, branches, and leaves,” Stier said. You definitely will find one in this Fallen Log exhibit, just open the doors to see what you will see! Now that the Amazing World of Dr. Seuss is open, The Museums are concentrating efforts on re-imaging the Science Museum. In addition to needed renovation and refurbishing of the building—flooring, bathrooms, lighting—the staff is exploring ways to increase the hands-on learning offered in the exhibits. 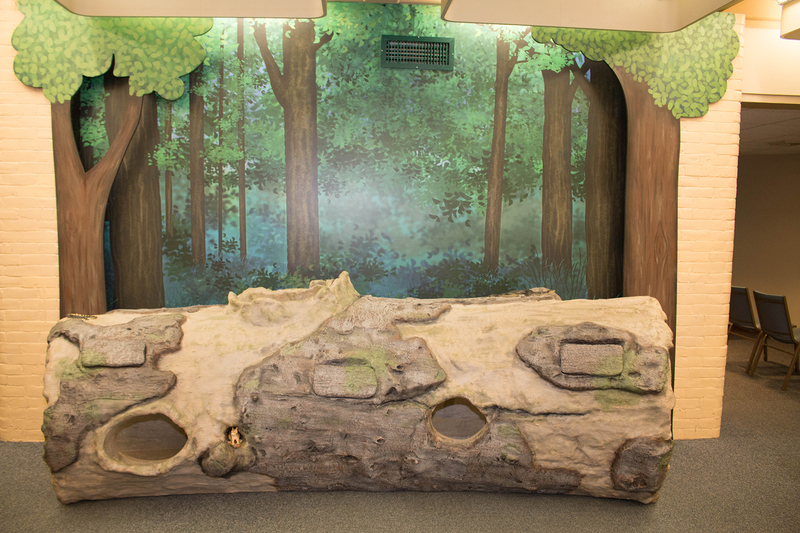 The Fallen Log is an example of the kind of immersive, hands-on interactives our visitors will discover in the museum. “The Springfield Museums believe in the transformative power of hands-on, interactive, immersive experiences that help visitors understand art, science, history, and literacy in unforgettable ways,” said Kay Simpson, President of the Springfield Museums. Stay tuned to see what else is new at the Springfield Science Museum.